Industrial tubeaxial and vaneaxial fan ventilators, high temperature tubeaxial fan ventilators, centrifugal and tube axial fans, roof / wall exhaust fans and tubeaxial ventilator blowers. Tubeaxial fans: axial flow through fans designed for low pressure building ventilation and industrial process application. Uses include heat, smoke, and fume removal; process ventilation and process air handling; proces drying with ambient or preheated up to 650 F air; comfort process cooling and general ventilation of buildngs. Available in direct drive arrangements 4/4M/4V/4D/4R and corresponding belt drive arrangements 9/9M/9V/9D/9R. Fan capacities: to 350,000 CFM. Static pressure to 4 inches water gauge. Aluminum wheel, Steel wheel, or Alloy fan wheel: tubeaxial fan for non-sparking x-proof applications is supplied in AMCA A, AMCA B, or AMCA C spark resistant ventilator construction in all aluminum welded construction, or in monel. For corrosive environment tubeaxial fan is supplied in 304 SS, 316 SS, or 316 L stainless steel fan construction. For chemical process applications tubeaxial fan is available in fiber reinforced plastic frp construction, or in polypropylene blower construction, or in plastic. 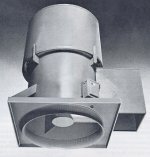 For high temperature fan applications up to 650 F tubeaxial fan is supplied typically in steel welded construction. Inlet flanges, outlet flanges, companion flanges: continuosly welded to match ANSI class 125/150, DIN, ISO, or custom hole pattern. Fan shaft seals: tubeaxial shafting is straightened to close tolerance to minimize "run-out" and ensure smooth operation. Bearings are of pillow plock, or flaged bearings. Ceramic shaft seal and lubricated shaft seals (Buna, Teflon, Viton) are standard. Red silicone gasketing is used on high temperature fan applications. 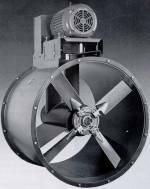 Heat fan construction up to 650 F: includes high temperature paint, shaft cooler, shaft and bearing tunel cooling auxiliary blower (optional), insulated shaft and bearing tunel, steel, or alloy wheel. Cladding for sound attenuation and silencers: cladding consists of 2 inches mineral-wool insulation covered with a welded steel jacket. Acoustic cloth jackets are available as inexpensive alternative. Inlet silencers/outlet silencers are supplied with matching flanges. Inlet vane damper assembly: external inlet vane damper is provided for precise air volume control. Standard fan accessories: flash / raised access door, inspection port, drain and plug, 3-way drain, mount feet, belt guard, motor cover, spring vibration isolation, rubber-in-share (RIS) vibration isolation, vibrating pads, electrical actuators, pneumatic actuators. Roof mount accessories: roof curb mount cap, roof curb, weather band, weather shroud with integral flap damper, butterfly damper assembly, magnetic latches. Controls and drives: variable frequency drives (VFD), across-the-line starters, RTDs, pressure sensors, flowmeters - complete control packages. Fans and Blowers Company offers different types of Industrial Make-Up Air Systems for larger industrial plants ventilation needs: custom built fans, ventilators, dust collection and combustion blowers.